Made from 1/2” plywood strips and some 1/4” carriage bolts, washers and wing nuts. Carriage bolts have to be grind a bit to fit into the rail. 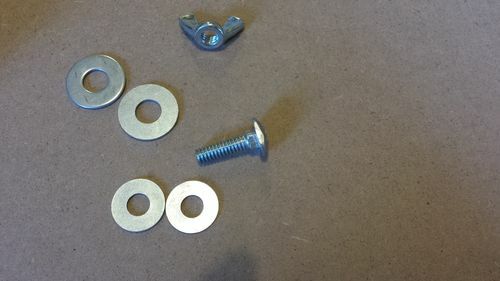 The metal plate is a piece of “Simpson Strong Tie” connecting plate cut into two pieces, bolted on the plywood with (4) #8 machine screws – countersink from plywood side. The existing holes were enlarged a little to fit the 1/4” bolts. The washers will provide additional flat spacer between metal plate and rail for plywood strips to sit flat on work piece. The initial set up is to mark the cut line on the work piece, align the track to the mark, then tighten the stop. 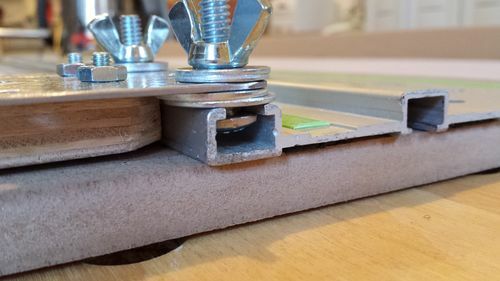 In some cases, I will clamp the 1/2” plywood strips onto the work piece instead of clamping on the rail when I needed by using regular clamps; they are also served as hard stops, because they are not as flimsy as the Festool one. Total cost about $5.00 and less than an hour of time. Good idea ,very well done. Creative approach! And you can’t beat the price! Great idea. I have been thinking about how I could make something like this. The Festool parallelogram thingie is fairly expensive. Genius. I had a lovely adventure setting up a parallel cut with my straight edge clamp and will be adapting your design for my home made parallel guides.